Are you looking to add a pretty table to your space? You’ve come to the right place! 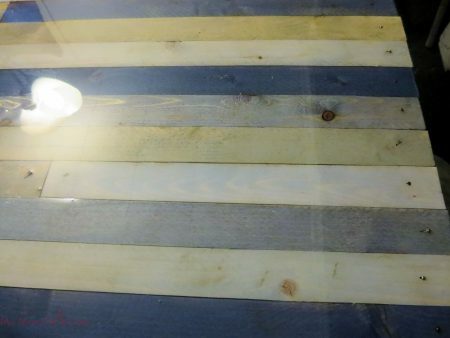 I am so excited to share my upcycled resin table with you, and I can guarantee you a one of a kind masterpiece if you follow this simple tutorial. 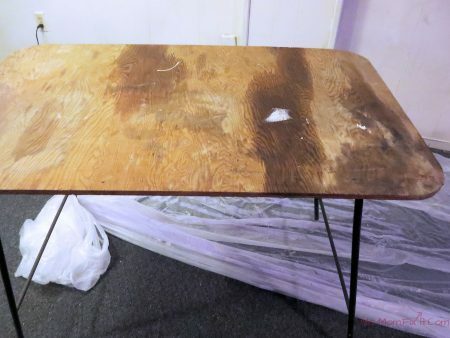 I happened to acquire a work table of sorts when I purchased my home. It was left behind by the previous owners and was quite unsightly. The garage was the perfect place for it! Well as we settled into our home, things started shifting, and I found the occasional need for a table in the basement recreation area. Plus, I added shelving to my garage which left the table in an awkward situation. 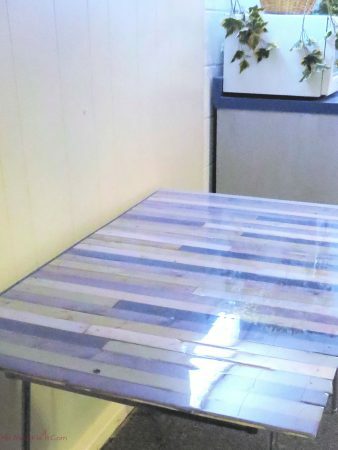 Upon inspection, I found that this table was a rehabilitated foosball table! I expect that this poor foosball table had seen better days. Looking at this picture, you might wonder why I didn’t just throw this to the curb. I had just finished my resin countertop and wanted something to match the basement décor. Plus, the table was the perfect height for crafting or putting together puzzles. The previous owner had simply attached the plywood top to the rectangular base with 2 L-brackets on each side for a total of 4 brackets. The bottom of the foosball table was already detached. 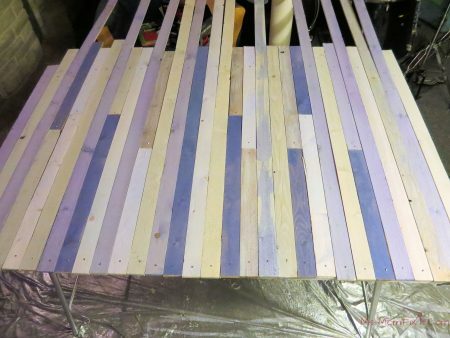 You could use this same process with virtually any old table or even just a piece of plywood with some kind of legs attached. 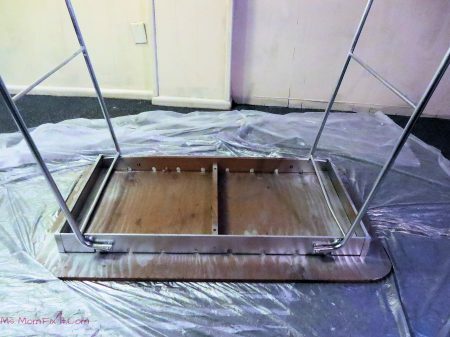 So, the first step in the transformation was to apply a fresh coat of silver spray paint to the legs and base of the table. 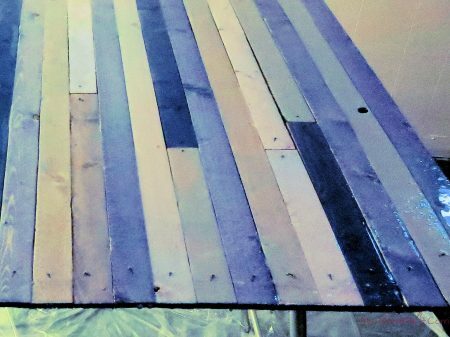 I had used wood laths to create a feature wall behind the bar and thought this would make the perfect complement to this table. allowing you to see a little grain. I used 4 different paint shades altogether although a few of the pieces were leftovers from the faux shiplap feature wall. Once my laths had dried, I nailed them onto the existing plywood top. You can create any pattern you like of course. I wanted to keep the same staggered effect that I used on my wall. 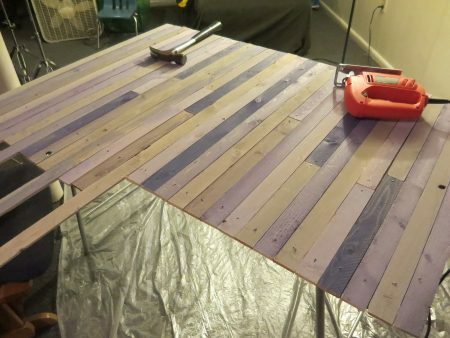 Once you have secured your boards in place, trim them down using a jigsaw or circular saw. Next, we start the resin process. While resin is self-leveling, you will have deep cracks between each wood board. Although these crevices are virtually non-existent to the eye, the resin will undoubtedly not be even with just 1 coat. Make sure to follow the manufacturer instructions carefully. You especially want to make sure your product is at room temperature. You will mix 1 part resin with 1 part hardener. After mixing together for 2 minutes, pour the contents into a separate cup and mix again for 2 minutes. Once thoroughly mixed, pour your solution onto your surface working in small batches. I used the included stir stick to spread out the resin as evenly as possible. After about 10 minutes, you will start to see bubbling in spots. I slowly apply heat from a Chef’s Torch over the surface. The heat will cause the bubbles to rise to the surface and disappear. The product will fully cure within 72 hours. However, you really want to apply your next layer before the previous layer has dried which is usually around 4 to 7 hours. I used 3 layers of resin product to complete this table and ensure a totally smooth, glass-like finish. 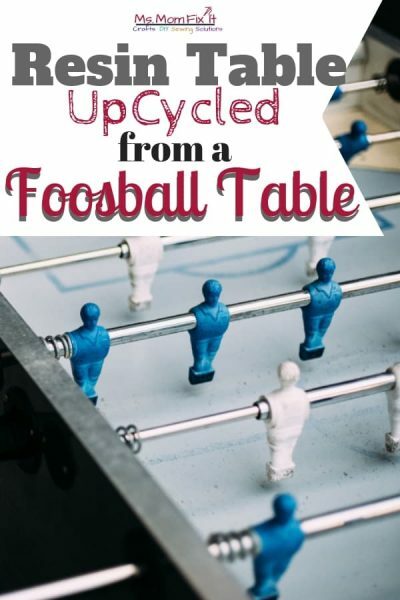 I simply LOVE my new upcycled resin table, and I’m sure no one would guess that this table was once a foosball table! Please share your upcycled projects!